The Heights General Store blends Texan, Southern, and Cajun influences into one delicious menu. Why did it take me so long to get to the Heights General Store? This is all I could think between bites of schnitzel, gumbo, and crisp, airy hushpuppies last week at lunch. 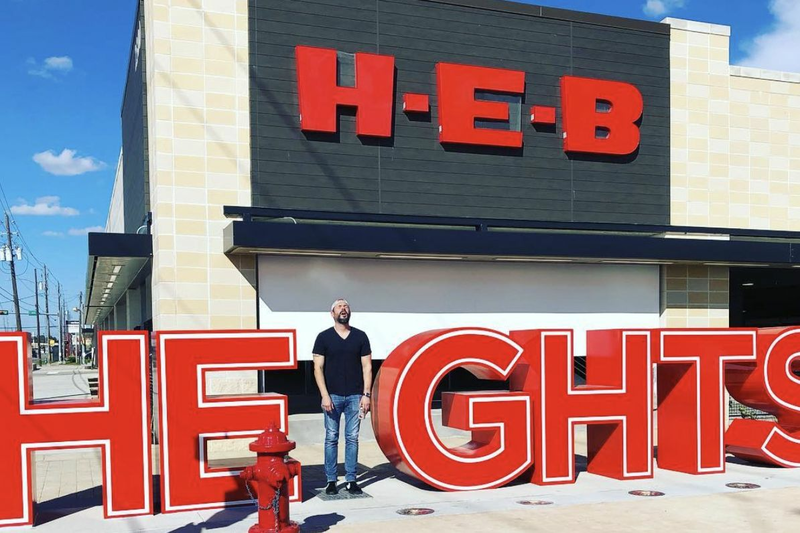 The restaurant/store—which opened last fall in the newly renovated building that once housed Harolds on 19th Street—is only a few minutes away from my office. The bright, airy space on the second floor where the restaurant is located (the store—think a more expansive Revival Market—occupies the first story) is a lovely lunch respite, especially on days when you can enjoy its welcoming patio that overlooks the Heights's bustling shopping corridor. And the lunch menu has something for everyone, from burgers to berry salads. Speaking of which, I could eat the peach and mozzarella salad my friend Stephanie ordered for lunch on a daily basis. 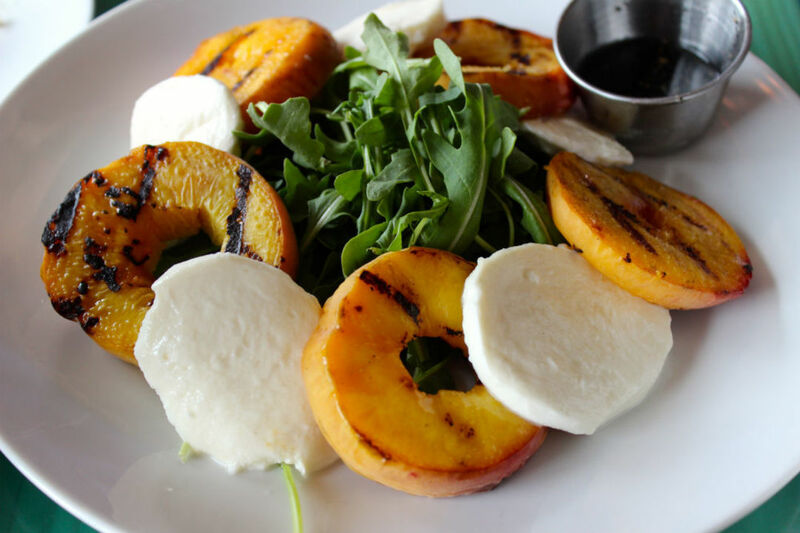 Grilled peaches are stacked between slices of Houston Dairymaids mozzarella, ringing a mound of peppery arugula. Stephanie asked for balsamic vinaigrette instead of the cilantro dressing that normally comes on the salad—a good substitution, it turned out, and one that I'll be making in the future. The tart, tangy, musky vinaigrette was just the thing on top of those sweet peaches and silky mozzarella. 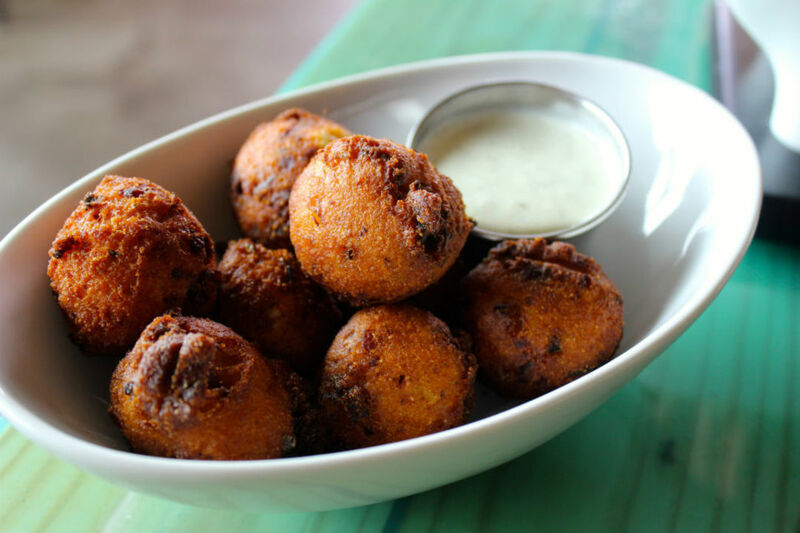 Hushpuppies with jalapeño buttermilk dressing. Equally excellent were the hushpuppies. I'm thrilled that Houston seems to be undergoing a hushpuppy renaissance between places like Heights General Store and Punk's Simple Southern Food, where the dish—often relegated to a neglected side item—has been receiving the sort of attention that makes the little cornbread spheres into standouts of their own. Here, they're light and fluffy inside, with a crisp exterior that's improved even further by dipping the hushpuppies into the jalapeño buttermilk dressing that's served on the side. In a final play to this Southern Americana revival trend, Heights General Store served up a pork schnitzel at lunch that made my German-Texan soul sing. Crunchy batter surrounded a tender piece of pork, pounded to that wonderfully thin texture that makes the edges curl into delicate shapes as the schnitzel cooks. 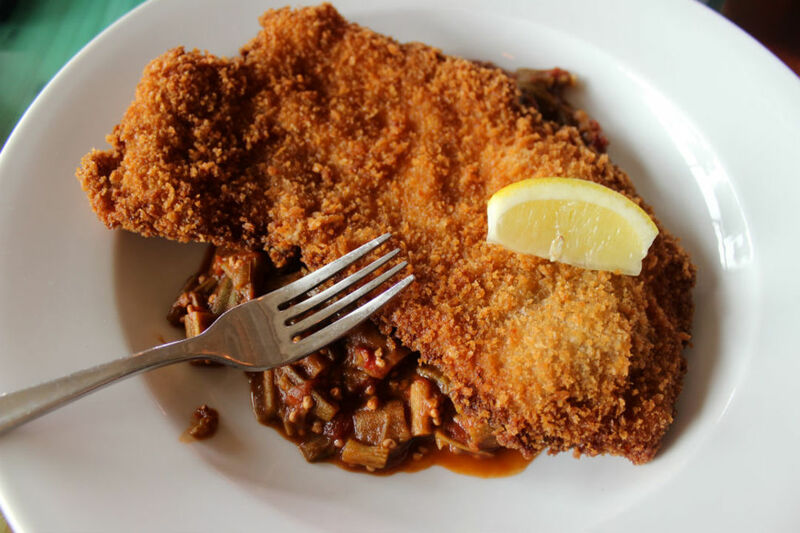 Served on top of a tomato-okra gumbo, the schnitzel is a very Houstonian dish in the way it bridges that Central Texas Teutonic heritage from the west with the Cajun influence from the east. And even if you aren't interested in culinary ethnography, it's still damn delicious. Pork schnitzel with tomato-okra gumbo. 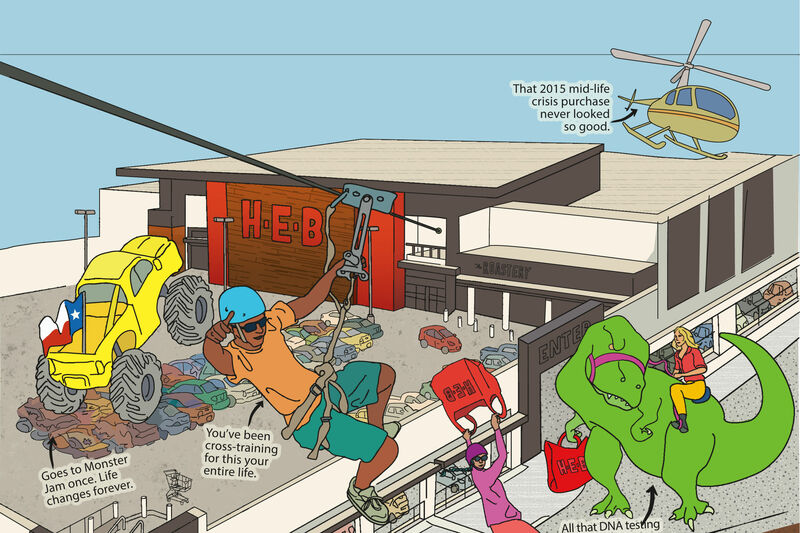 It's this blending of cultures and emphasis on classic Americana I'm eager to go back and experience at Heights General Store. 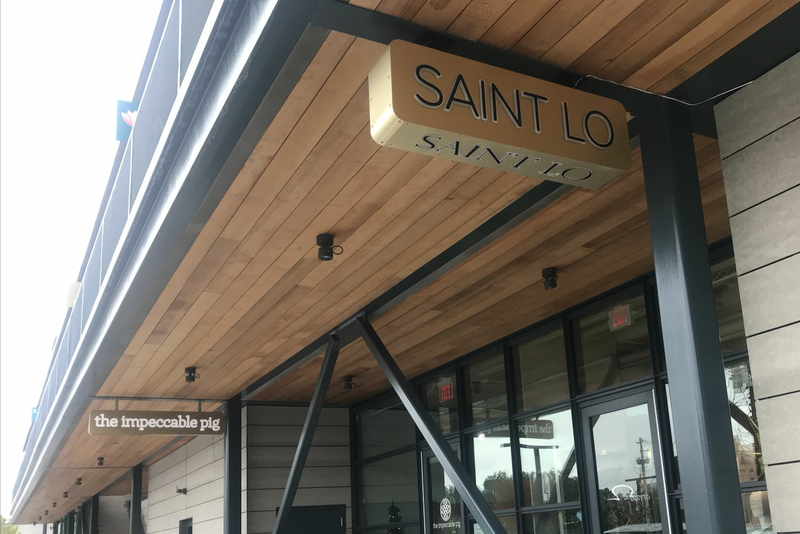 Owner Alli Jarrett hails from a small town in the Lowcountry in South Carolina, where her family ran a food store of their own, while chef Antoine Ware is well-known for his New Orleans cuisine—so the interwoven influences here make a lot of sense. Though I might just cave and get that peach and mozzarella salad again. And again. And again.